In today’s work landscape, people aren’t limited by what corporate position they hold or what their job title is. Everyone can piece together their dream career with initiative, hard work, and a little luck. Perhaps there’s no better example of that than Jacob Morgan, a leading author, speaker, and expert on the future of work. He also happens to be married to me. After a few disastrous jobs in the corporate world, Jacob realized he wanted the freedom to work for himself and push himself in new ways. Instead of just getting coffee for executives, he wanted to be guiding them and helping them create good environments for their employees and customers. The path from recent college grad to a successful speaker who now travels the world wasn’t easy—Jacob started out speaking for free and hustling to make his voice heard, but his career has grown and gained momentum over the last decade and put him in a position to continuously expand and grow his brand. Jacob’s formula for success as a professional speaker and author, or really as just an entrepreneur with a voice, is to “Be everywhere all the time”. To him, building a personal brand comes down to three things: consistency, visibility, and frequency. You need to pick a topic as your expertise and be as consistent as you can with it. Instead of bouncing around and addressing a number of business-related topics, Jacob writes and speaks only about the future of work and employee experience, which has built his brand and made him the go-to expert in those areas. To be visible, Jacob says you have to be everywhere in the most seen places, which includes making podcasts, writing articles, attending conferences, and more. And frequency means doing it all the time. Between the articles, blogs, videos, and podcasts, Jacob’s content is always being published, which keeps him fresh in his viewers’ eyes; the same principle applies to anyone building a personal brand—be frequent to keep content new and fresh. Building a personal brand is a continuous effort, but it can eventually open doors to new possibilities. 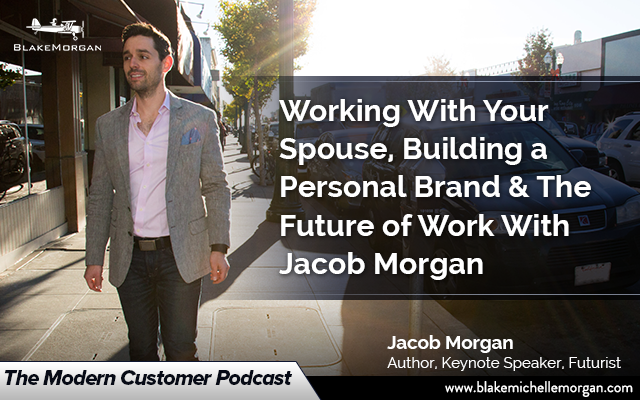 In Jacob’s case, it has led him to writing three books and now working with his spouse where he and I can find the crossover between their respective work with employee experience and customer experience. Between Jacob’s personal experiences working in the corporate world and his research and travels that have taken him to organizations around the world, he has become passionate about organizations building effective employee experiences, which play a huge role in the future of work. As technology grows and the workforce changes, employers need to change their mentality around work to focus less of tasks and more on people. To create a company where people want to work, executives need to be aware of the people who work there, which means getting out from behind their desks and actually interacting with employees and customers. Leaders need to start a dialogue with employees about what they like and dislike and what can be improved. Employees also need to get engaged and join the conversation—if they want to help build a human-centered organization that can withstand changes to the workplace, they need to stand up and make their voice heard. The future of work is changing and opening doors to new opportunities for people in all industries. To prepare, employees need to build their personal brands and get involved in their organizations. If there is something you are unhappy with, follow Jacob’s example and either fix it or get out. With involvement and dedication, you can better your organization or create your own opportunities to build a career that is perfect for you.